It's fashionable on the Left to look down one's nose at the world of sports. To do so, according to Dave Zirin, would be to miss a chance at both inspiration and solidarity. 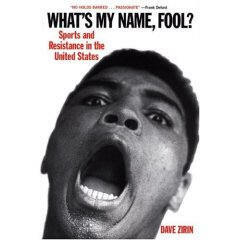 Zirin's new book, What's My Name Fool? Sports and Resistance in the United States creates a much-needed bridge between the political and the playing field. I interviewed my fellow sports fan/subversive via e-mail. Mickey Z: Were you a sports fan before you were a radical? How did you come to meld the two? Dave Zirin: I have been a sports fan as long as I remember breathing. My father grew up in Brooklyn and raised me with stories about Jackie Robinson dancing off of first base and trading in bottle refunds for tickets to Ebbets Field. I became a "radical" by very non-radical means. Being in High School during both the first Gulf War and the 1992 Rodney King Verdict/LA Rebellion led me to believe that there was something very wrong with the structure of the United States. For a long period, I thought that being a sports fan was contradictory with fighting for a better world. I thought I had to treat sports the way a vegan would treat a McRib. I went several years in the 1990s with this monastic approach to Pro Athletics. Two events changed my thinking: one was the heroic and doomed response to Mahmoud Abdul Rauf and the book Redemption Song: Muhammad Ali and the Spirit of the 60s by Mike Marqusee. MZ: I only recently read "Redemption Song" and I agree. It put sports and politics into proper context. Since your book takes it title and cover image from the amazing life of Muhammad Ali, talk to me about how The Greatest's radical stances have been sanitized. DZ: Ali is a terrific and terrible example of how one's political teeth can be extracted with extreme prejudice. A common analysis of the Black Power movement of the 1960s is that one wing was co-opted and one was destroyed. Ali in some respects in the physical representation of that process. He has certainly been co-opted. Louisville, the city that once renounced him through a city council decree, now as a highway named in his honor. He was used to "sell" the war on terror to the Muslim world by the state department. His image hawks everything from Sprite to Microsoft. That said, he was also destroyed. The stripping of his title, meant that when Ali returned to the ring after his many year absence, he was slower and had to rely on his ability to take a punch. This no doubt led to his current medical condition. MZ: Forty years after Ali created that stir, Pat Tillman is the standard by which athletes are measured, vis-à-vis politics and patriotism. I know I took some hits for my challenging of the Tillman-as-hero motif, what kind of response did you get? DZ: I wrote two rounds of articles on Tillman. The first was about how his death was being exploited in a manner that Tillman himself would have been repulsed by. I wrote that to the Pentagon, Tillman was far more useful dead than alive. This got me everything from death threats to profanity laced tirades, to legitimate thank yous from people, including one man who played in high school with Pat Tillman. When the recent story emerged that Tillman was killed by Friendly Fire and his parents and family were LIED TO by the government so they could have a feel good hero's funeral, I wrote about Tillman again. This time the haters, crackpots, and chickenhawks didn't have the guts in the face of the sick and sorry truth: that Tillman's death was exploited for the aims of this war. This is an obscenity and we should call it out as such. MZ: Do you think if Tillman had talked with Charles Barkley, Etan Thomas, or Toni Smith (all featured in Zirin's book) before he enlisted, he might have stayed home and found other ways to fight for justice? DZ: Who can say? I know that Pat Tillman - like many people around the world -- was shocked and outraged by the events of September 11th and saw joining the Army Rangers as an appropriate response. I think it's less about other athletic figures talking him out of enlisting, than his parents Mary and Pat senior, who knowing what they know now, would have -- I believed -- moved heaven and earth to keep him home. MZ: Is it more likely that your book can lead the ESPN crowd to examine their political convictions (or lack thereof) or inspire lefties to appreciate the complex world of sports? Would one please you more than the other? DZ: Honestly, that is my goal and I view them of equal import. I want to see activists take the nexus of sports and politics more seriously. Last week I was at a poetry reading by Wizards back up power forward Etan Thomas -- poems about the war in Iraq, the death penalty, and political corruption, and there was no one from the DC "left" there. That to me is a problem. I also want the book to be a way for sports fans who love sports but are just sick of the way they are packaged, to not only have an outlet but a recognition that there is a tradition of people just like them: both on the field and in the stands. Dave Zirin's new book, What's My Name Fool? Sports and Resistance in the United States, is now in stores. You can receive his column Edge of Sports, every week by e-mailing edgeofsports-subscribe@zirin.com. Contact him at: dave@edgeofsports.com.